The Current Study: The world Unplugged study released on this website, is a global 2.0 version of an earlier study conducted in spring 2010, with students at the University of Maryland, College Park, USA, who undertook an assignment that challenged them to go media-free for 24 hours. In the summer of 2010, the results of that study “24 Hours: Unplugged” (click for further details) were presented to the partner universities at the Salzburg Academy of Media & Global Change in Salzburg, Austria and those universities participating in “New Directions in Global Media Education” session, a program hosted by the Salzburg Global Seminar during the 2010 Salzburg Academy. A dozen universities in the USA and around the world expressed interest in participating in a new global project. The deans and faculty at those schools noted that the results from the USA study offered an intriguing glance into not just life on college campuses in the 21st century, but how media are changing how students work and socialize, and how they feel and think. As a result, in the fall those various universities on five different continents (Africa, Asia, Europe, North America and South America) participated in the world Unplugged project. The countries represented are: Argentina, Chile, China (mainland), China (Hong Kong), Lebanon, Mexico, Slovakia, Uganda, the United Kingdom, and the United States of America. In addition to the University of Maryland, College Park (USA), those universities that participated in the study are: Pontificia Universidad Católica Argentina, Pontificia Universidad Catolica de Chile, Chongqing University (China), the Chinese University of Hong Kong, Hong Kong Shue Yan University, the American University of Beirut (Lebanon), Universidad Iberoamericana (Mexico), University of St. Cyril and Methodius (Slovakia), Makerere University (Uganda), Bournemouth University (UK) and Hofstra University (USA). Students at all the universities completed the world Unplugged project between September and December 2010. Unlike the spring 2010, which consisted of one class of 200 students participating in the project over the course of a specific week, the international universities conducted the world Unplugged experiment on their own schedules. The specific dates chosen to complete the assignment varied according to the universities’ semester calendars and curricular needs. The dates for each university’s experiment are listed on the University Partners pages. All 12 universities shared the same assignment template. Any variation in the questions asked of students is explained on the individual university profile pages. In this global study, as in the first US-based one, all the participants in all the universities were asked to complete a SurveyMonkey online survey that included basic demographic data, including country of origin, racial identity, age, gender, religious identity, as well as questions about their ownership and use of particular media devices (e.g. did they own a mobile phone or MP3 player? How many hours did they spend each day playing video games or on social-networking sites?). The results of the survey are graphed on the Student Statistics tab here [found under the ABOUT tab]. All the students’ narratives responses were gathered by the universities and collected by researchers at the University of Maryland. Chinese language responses from Chongqing University were translated in China by university translators; other non-English responses were translated at the University of Maryland by native language speakers, assisted by automatic translation software. Following the data collection and translation, a two-stage process of analysis was used to organize the data. First, student researchers were trained in data analysis. All the student responses were read, at a minimum by two student researchers, overseen by a faculty researcher. The responses were analyzed using keywords captured by IBM’s ManyEyes software, which allowed the researchers to develop categories of evaluation: of emotional reactions to the experiment and of reactions to the experiment based on the student’s relationship to a particular type of medium (mobile phone or TV, for example). Using a sample of responses, three researchers generated a list of emotional words and devices, and then grouped the words into categories. For example, terms such as dependence, addict, addiction, withdrawal were all gathered under the “Dependence” category, while peace, relief, pleasure, happy, glad and other terms were gathered under a “Benefits of Unplugging” category, and so on. Following a computer-assisted analysis of the data, the responses were hand-coded by at least two researchers, and then reevaluated by a second team of researchers who then further organized, analyzed and wrote up the data by country, by medium and by emotional response. The findings are released on this website. Please note that that all the quotations on this site are actual quotations from students in the classes. For clarity, the spelling, capitalization, punctuation and grammar of all quotations have been regularized to American standards. Note too that the authors of this study have put certain parts of quotations in boldface; the bold words are an effort by the study authors to highlight key themes in the students’ comments. Please also note that with only 1000 people included, the Unplugged study is not a representative sampling of students in each of the dozen universities represented; it reflects only a snapshot of responses to going without media in the 10 countries studied. It is the case, however, that despite some vast differences among countries – geographic, political, religious and economic – researchers found striking consistencies in the responses of students. 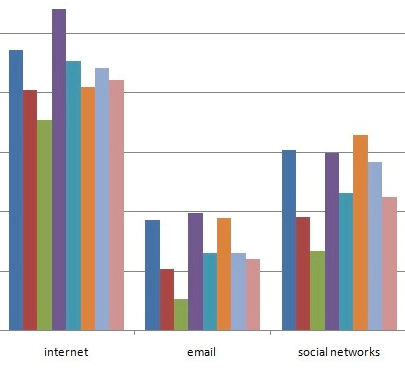 The ubiquity and dependence on social media and mobile devices, in particular, extended to every university from Uganda to Hong Kong, from the UK to Chile. Digital natives appear related to each other in ways that transcend even their disparate national origins. Your assignment is to find a 24-hour period during which you can pledge to give up all media: no Internet, no newspapers or magazines, no TV, no mobile phones, no iPod, no music, no movies, no Facebook, Playstation, video games, etc.. If you lapse by mistake (i.e. you answer a phone call without realizing it), do not then “give up.” Note the mistake and go on to finish your 24 hours. If do NOT make it the full 24 hours, be honest about it. How long did you make it? What happened? What do you think it means about you? Although you may need to use your computer for homework or work, try to pick a time when you can go without using it — which may mean that you have to plan your work so that you can get it done before or after your 24-hour media-free period. You will not be judged on whether you went 24 hours, but we expect that you all will make it through the entire time without using any forms of media. After you have completed your 24 hours you are to write about your experiences. Your comments should be at least 300 words. In your comments, you may want to reflect on the following questions: What about your day was different in terms of logistics? Did you feel any psychological effects? Were you surprised either by how hard or how easy it was? What does your experience say about you, about our society and about how you — and everyone around you — use media? If you find that you are tied to media, what about those in our society who are not connected? Is there something they’re missing? Is there something you’re missing out on by being so surrounded by media? Background: The First “Unplugged” Study: In early 2010, a class of 200 students at the University of Maryland, College Park, undertook an assignment that challenged them to go media-free for 24 hours. Students had to go media-free (or try to go media-free) for a full day, but they were allowed to pick which 24 hours in a nine-day period, from February 24 to March 4, 2010. Some students, worried that they wouldn’t be able to make it through a 24-hour span without using media, picked a weekend day to go without media, believing that they could distract themselves by playing sports or going on a road trip. 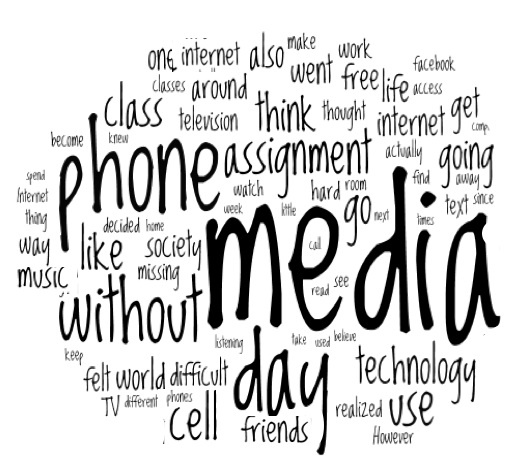 Others picked a weekday, believing that the loss of media would be less difficult because they would be in class and at work and so would have little time to “miss” the media they had to forgo. After their 24 hours of abstinence, the students were then asked to blog about their experiences: to report their successes and admit to any failures. What had they learned about their own consumption of media — and how did they feel about to being forced to go without? In response to those questions, the 200 students wrote over 110,000 words on class blogs sites: in aggregate, about the same number of words as a 400-page novel. Students also filled out a consent form (allowing research use of their comments) and a separate demographic survey, via SurveyMonkey.com. The student reports were then read, coded by multiple readers and analyzed. (For more details on the methodology, please see here. Several textual analysis tools at IBM’s ManyEyes’ site –﻿﻿ Word Tree, Tag Cloud, Phrase Net and Word Cloud Generator — were employed to help sift through the students’ reportage. A qualitative report of the findings was publicly released on the 24 Hours: Unplugged website. Upon its release, the study received extensive media coverage. Reuters, the New York Times and the Washington Post were among several major media outlets to cover the study. It has since garnered further attention, both domestically and internationally. And a collection of some of the articles on the study by Blackberry’s aggregator. Led by the International Center for Media & the Public Agenda (ICMPA), University of Maryland, USA. Click to read how this study was conducted. Click to see charts on who took part in this study. Click to see charts comparing student responses, by country. © Copyright Susan D. Moeller, 2011. All Rights Reserved..
© 2019 Susan D. Moeller. All rights reserved.